Background: Tuberculosis is one of the most prevalent infectious diseases. Treatment of tuberculosis requires treatment for a long duration with a combination of drugs such as Isoniazid, Rifampicin, Pyrazinamide and Ethambutol. Certain subsets of the population are more susceptible to adverse effects of treatment with isoniazid. Identification of the related genetic polymorphisms will enable Personalized Medication with optimized combination and dosage of the available drugs for each individual. Objective: Identification of the molecular targets responsible for differences in susceptibility to the adverse effects of isoniazid drug. 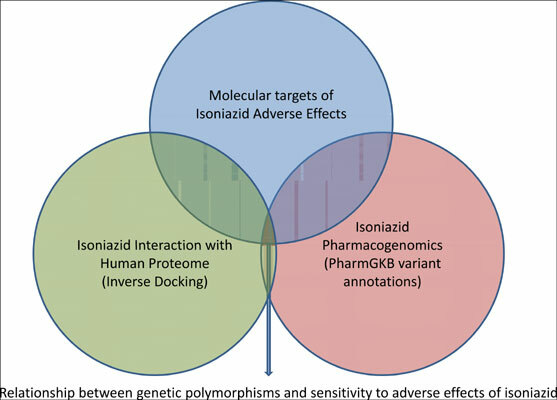 Method: Inverse docking was used to identify potential molecular targets of isoniazid in the human proteome. The molecular targets and the annotations obtained from inverse docking were compared with those obtained from PharmGKB variant annotations. Results and Conclusion: The results of this study are consistent with and rationalize earlier biochemical, molecular and clinical studies that relate prevalence of isoniazid induced adverse effects to genetic polymorphisms in NAT2, GSTT1, GSTM1 and CYP*. The computational results of this study indicate that MAO, COMT and NNMT are additional potential targets related to variation in isoniazid induced adverse effects. Pharmacogenetics, pharmacogenomics, inverse virtual screening, inverse docking, adverse effects, tuberculosis, isoniazid, interactome.